I actually looked up the weight of hair, and this doesn't really work because hair is something like .1 kg per foot. However, since it's a free body diagram, we can round that up to 10 and it's fine. I don't really see why the changing center of mass should cause her to fall? All she has to do is hold on to something, which could even be the wall surrounding the window. What kind of monster uses kilogram per foot? More to the point - why is her hair staying what looks like about 4m away from the wall on the way down? Normally it would pretty much lie against the outside of the wall, so her center of mass would be in the wall somewhere and she'd be fine. Well, as fine as you can be when you're trying to support the weight of 100m or so of hair plus 70kg or so of prince with your scalp. Scarlet Manuka wrote: More to the point - why is her hair staying what looks like about 4m away from the wall on the way down? This may have to do with its crunchiness. 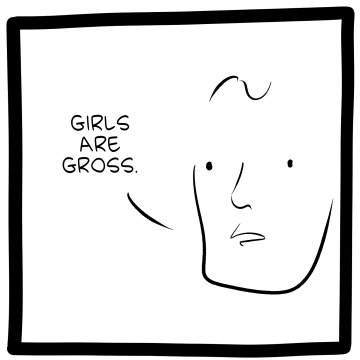 Knowing how a lot of old fairy tales go, this still is a more positive outcome than most. 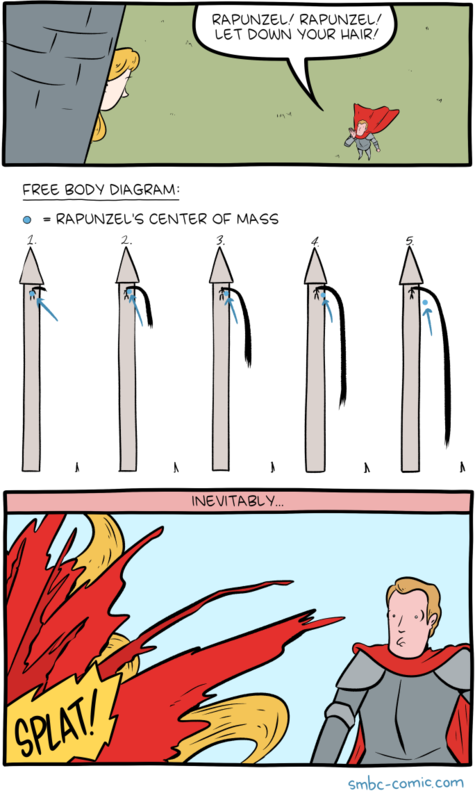 How many Rapunzel comics does SMBC have?